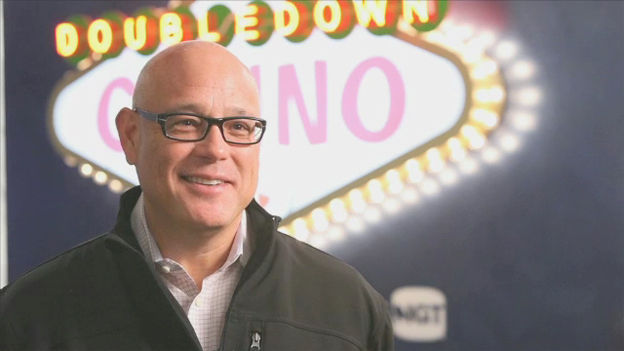 Robert Melendres, IGT executive vice president, IGT Interactive Group, comments on the global launch of DoubleDown - a social, online casino that delivers a Vegas gaming experience. 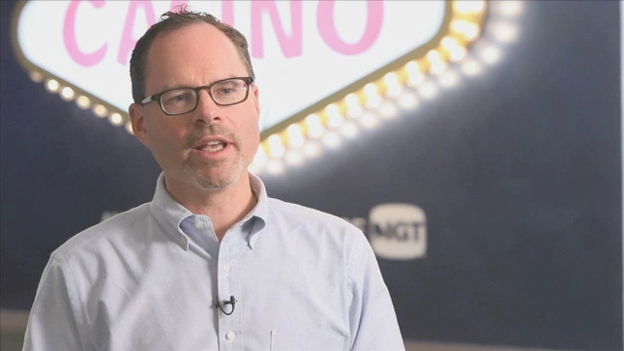 John Clelland, vice president of global marketing for IGT Interactive Group, comments on the global launch of DoubleDown - a social, online casino that delivers a Vegas gaming experience. LAS VEGAS--(BUSINESS WIRE)--International Game Technology (NYSE: IGT) a global leader in gaming systems technology, today announced it will bring its love for Las Vegas to players around the world by making DoubleDown Casino available in French, German and Spanish. As the exclusive online provider of IGT slot games found on real casino floors and a large selection of table games and bingo that are all free to play, DoubleDown transcends Las Vegas gaming online. Every day, over 1.7 million people play DoubleDown casino games for fun on Facebook or on mobile devices. DoubleDown provides the widest variety of Vegas-style social casino games for beginners to enthusiasts – and now, those who prefer playing in French, German or Spanish can access popular IGT Slot titles such as Kitty Glitter™ Cleopatra™, Wolf Run™, Cats™ and Siberian Storm™; table games such as Game King’s Video Poker™, Black Jack and Roulette; and bingo, among others. In 2012, DoubleDown Casino players quickly grew to tens of thousands throughout France, Germany and Spain, indicating a market need for multi-lingual options. The company plans to release its games in Italian and other languages by the end of 2013. DoubleDown casino games are free to play online, on Facebook and on mobile devices, including iOS, Android and Amazon’s Kindle Fire. New players receive a million free chips when they join at www.doubledowncasino.com, http://apps.facebook.com/doubledowncasino, or http://m.doubledowncasino.com/. DoubleDown Casino is the top grossing online destination for players who want to access Vegas-style multiplayer games, including Poker, Slots, Blackjack, Roulette, Bingo and more on Facebook and on mobile devices, including iOS, Android and Amazon’s Kindle Fire. DoubleDown Casino also features single player table games including rgs® Black Jack, Roulette and Game King’s Video Poker™. As a wholly owned subsidiary of International Game Technology (IGT), DoubleDown Casino features the hottest IGT content straight from the casino floor. International Game Technology (NYSE: IGT) is a global leader in casino gaming entertainment and continues to transform the industry by translating casino player experiences to social, mobile and interactive environments for regulated markets around the world. IGT's acquisition of DoubleDown Interactive provides engaging social casino style entertainment to more than 6 million players monthly. More information about IGT is available at IGT.com or connect with IGT at @IGTNews or facebook.com/IGT. Anyone can play at the DoubleDown Casino by visiting http://apps.facebook.com/doubledowncasino or doubledowncasino.com. This document contains forward-looking statements that involve risks and uncertainties. These statements include our expected future financial and operational performance and our strategic and operational plans. These statements involve a number of risks and uncertainties that could cause actual results to differ materially from the results predicted, and reported results should not be considered an indication of future performance. Among the factors that could cause actual results and outcomes to differ materially from those contained in such forward-looking statements are the following: general economic conditions and changes in economic conditions affecting the gaming industry; new or changing laws or regulations or new interpretations of existing laws or regulations affecting our business; difficulties or delays in obtaining or maintaining necessary licenses or approvals; slow growth in the number of new gaming jurisdictions or new casinos or the rate of replacement of existing gaming machines; changes in operator or player preferences for our products; our ability to compete in the gaming industry with new or existing competitors; our ability to develop and introduce new products and their acceptance by our customers; risks related to our international operations; our ability to protect our intellectual property; adverse results of litigation, including intellectual property infringement claims; risks related to business combinations, investments in intellectual property and the integration of acquisitions; and future developments or changes affecting online gaming or social casino-style gaming, which is a new and evolving industry. A further list and description of these and other risks, uncertainties and other matters can be found in our annual report and other reports filed with the Securities and Exchange Commission, including under the captions “Risk Factors” and “Management’s Discussion and Analysis of Financial Condition and Results of Operations” in our Annual Report on Form 10-K for fiscal 2012 filed with the SEC on November 28, 2012 and available on the SEC website at www.sec.gov and on the investor relations section of our website at www.IGT.com. All information provided in this letter is as of the date hereof, and IGT does not intend, and undertakes no duty, to update this information to reflect subsequent events or circumstances. International Game Technology (IGT) brings its love for Las Vegas to players around the world by making its online, social casino, DoubleDown, available in French, German and Spanish.